Capable of removing watermark from any number of files. Embedded images can also be removed like stamp, signatures etc. Can only remove watermark from the files of adobe acrobat reader. Data of original PDF file will be kept intact. No changes will be made regarding structure & formatting of text. This tool can remove Watermark from multiple files and folders altogether. And to add multiple files in a single click, it provides the option "add folder". User can store multiple files in a single folder and can add the folder to the software panel to remove Watermark. It can remove embedded images also, which includes some kind of signature, logo, stamp or watermark. All these can be easily and efficiently removed removed without disturbing the text and other information of the original PDF file. The structure of the file is kept undisturbed while processing. No changes will be made to file regarding the text it contains or the information it stores. PDF watermark remover will kept the data secured, only the watermark will be removed. The file generated after the processing will be stored in a new folder. So changes will be made in a copy of your original PDF file. And the location for saving the file at your own choice can also be browsed by by browse button embedded in software. A progress report will be generated at end of process completion. It will specify complete details of the process that took place, which includes a number of files, path of file, its current status. Before implementing removal action, default status "Not started" will be displayed. 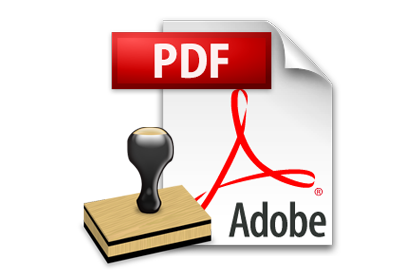 Tool to remove watermark from PDF document can work with various versions of adobe acrobat reader, which includes the version 9.0 and below. To execute operation in adobe PDF watermark remover it is necessary to have acrobat reader installed on the system. PDF files present on Windows Operating System can be selected to delete watermark. 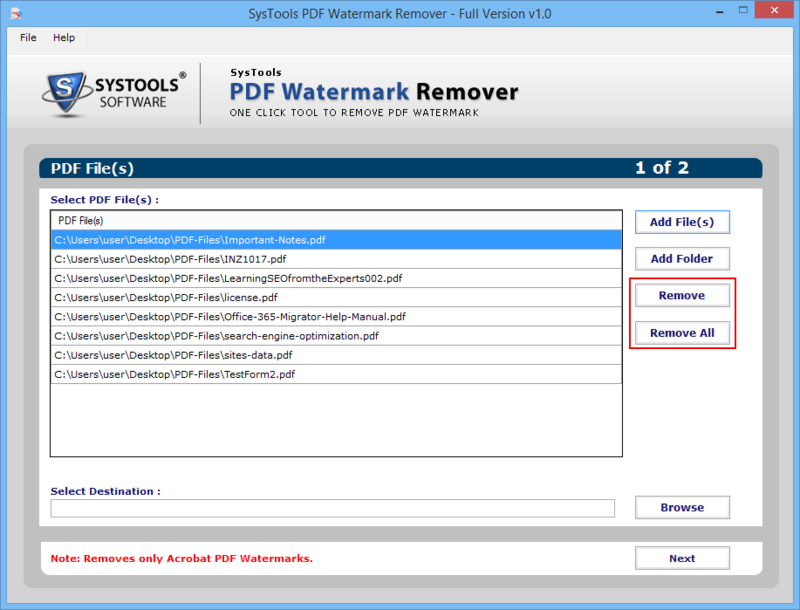 As PDF watermark remover is a window based tool operatable with all versions of Windows including Windows 8. It permits users to perform effortless software download. 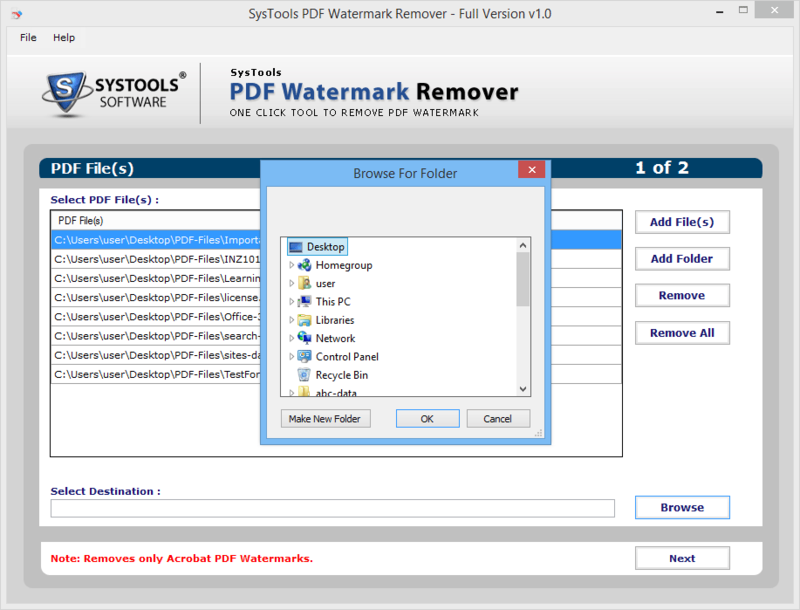 Remove Watermark from PDF tool is integrated with a strong algorithm and simple graphical user interface, which makes it's operation simpler for technical as well as non-technical user. Or in other words you can say that no external guidance or knowledge is required to operate this tool. Step 1: Open the tool panel. 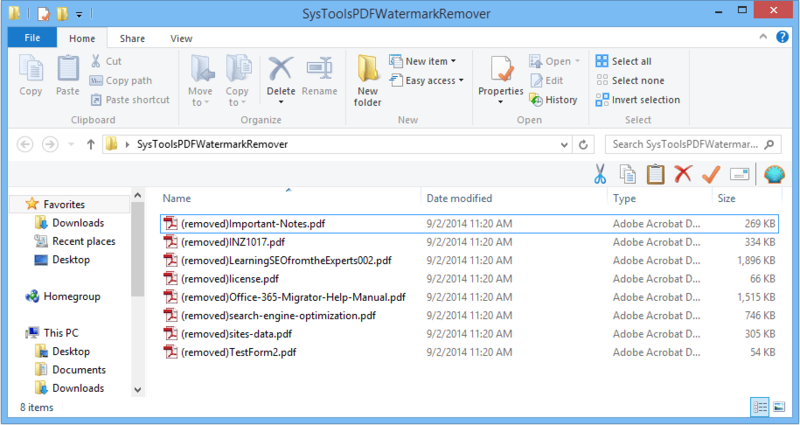 Go to start-> PDF Watermark Remover. Step 2: Select "Open PDF" to start the process. 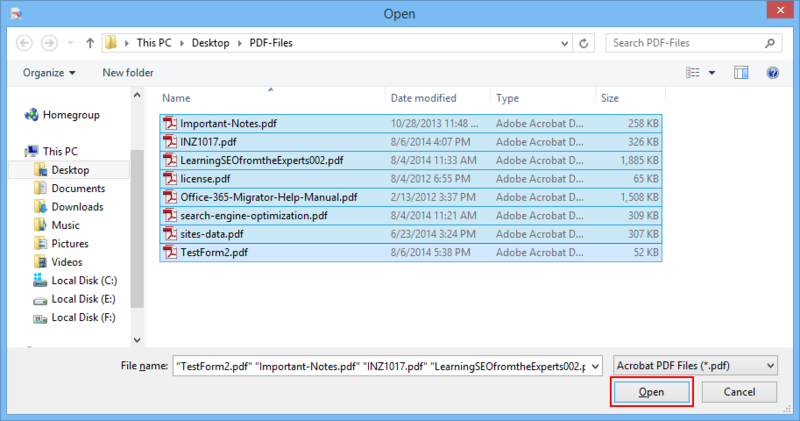 Step 3: To add files to the panel, select "Add File" or "Add Folder". Step 4: Choose the PDF files from the ones you want to remove the watermark. Step 5: The files will now be added to the panel. If you want to remove any or all, click "Remove" or "Remove All" button respectively. Step 6: "Browse" the destination location to save the file. Step 7:A pop-up window will be displayed, choose the location from the directory where you want to store the output file. And proceed by clicking "OK". Step 8:Cross-check the details selected by you and click "Next". Step 9: Summary of the process will be displayed on the tool panel. Reverify the details and click "Start". Step 10: After the completion of whole process, click "OK" to close the software window. 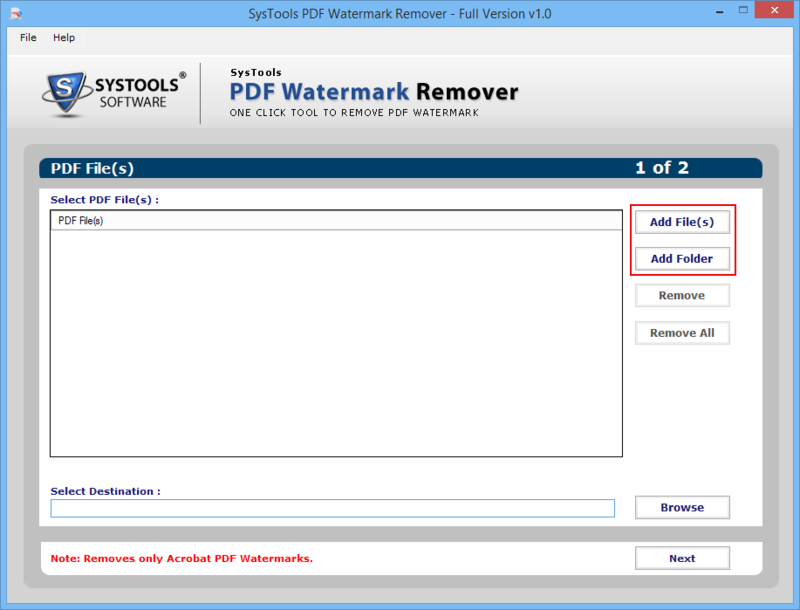 Step 11: Check and confirm that Watermark has been removed from selected PDF files by opening the output file. While working with the previous firm I watermarked a few of my PDF files using the Adobe Acrobat Pro version provided to me. However, after switching I needed to remove the company watermark from those file and had no other way to do it. 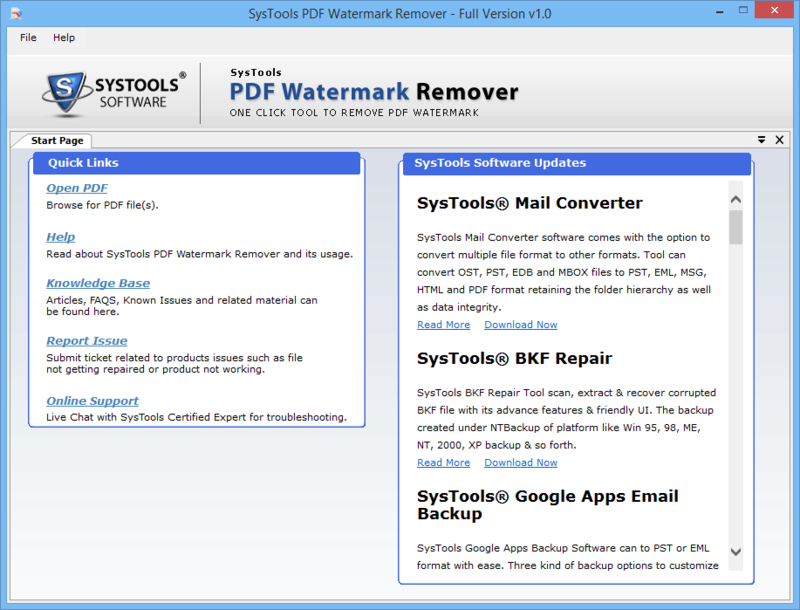 Thankfully PDF Watermark Remover offered instant help! Applying the watermark wasn't a big deal but later facing restrictions that came with it were. Planning to remove the watermark from a heap of my PDFs was a situation I found tough to tackle. But a wonderful helping hand was extended by team Bates Numberer in the name of PDF Watermark Remover.